The author is the cattle systems contract research manager for the Noble Research Institute. Ruminants have a distinct advantage compared to other livestock because of their ability to process highly fibrous, otherwise nonutilizable, feedstuffs into a marketable product. They also thrive in geographic regions that would otherwise go underutilized. Oftentimes, this conversion advantage is only referenced to specific, industry-related outcomes such as body condition, parturition, and/or weight gain. However, a bigger picture perspective points to the societal benefits these animals possess. This is especially true for cattle based on their contribution to human-consumable protein (per capita beef consumption is approximately 55 pounds) and the overall magnitude of the cattle industry’s economic impact ($88.25 billion in receipts). Considering beef’s broader contribution and the likelihood that hay and pasture costs comprise between 30 to 35 percent of a spring-calving cow herd’s total production cost, it is imperative for operations to strive for efficient capture, allocation, and utilization of forage resources. This can be done through a systematic grazing plan and an efficient supplemental feeding program that includes hay as a potential option. Whether hay is raised or purchased and regardless of quality, it’s important to ensure we get the most from its consumption. If hay will be supplemented, there is no substitute for a nutrient analysis. Testing is preferably done prior to purchasing and especially before feeding to determine any major deficiencies and additional nutrient needs. Your allocation is also important and can alter the overall efficiency by which the hay’s “stored” nutrients are utilized. Most often, allocation consists of a hay bale placed in the middle of a pasture, or next to mineral and a water source. Although this is commonly the case, it isn’t the most efficient means of feeding hay. Minimally, use a bale ring to maintain the integrity of the bale for as long as possible and to reduce losses caused by trampling and contamination from urination and defecation. To further reduce wastage, consider labor availability and minimize the amount of hay offered, but be sure to meet the daily intake needs of the animals being fed, especially if a hay ring isn’t being used. The delivery method of forages stimulates intake and affects consumption. For example, driving into a pasture brings cattle up to a feeding area, which stimulates greater feed and supplement intake compared to simply setting out a bale of hay. Many producers are trying to further improve the overall efficiency of feeding hay and are investigating other means of allocation. Bale processors are one such mechanism of choice and are used to deliver hay in both pasture (windrows or troughs) and pen environments. Here at the Noble Research Institute, we have been processing hay at our Oswalt cattle facility for the last year and feeding cows and calves in windrows and bunks. Vermeer Corporation has helped us with technical assistance and with evaluating equipment and accessories. From a strictly nutritional perspective, processing (lightly chopping) hay improves utilization by allowing easier access to structural and nonstructural carbohydrates by the rumen’s microbial population. This is especially true for roughages that are lower in quality. Digestibility typically improves 10 to 12 percent anytime a forage is processed. Operationally, the processor is very easy to use and does a good job of uniformly chopping most roughage sources, including bermudagrass, alfalfa, soybean, rye/ryegrass, switchgrass, and native grasses. Overall, we have witnessed less wastage when “windrowing” the hay for cows on pasture, but we have had some difficulty feeding in our concrete bunks, especially during high winds. As with any piece of equipment, we continue to learn more and better ways to use it. A good example is using the processor to cover newly constructed pond dams and right-of-ways, where it worked very well and raised organic matter in those areas. As one would imagine, the biggest potential downside is the machine cost. This must be weighed on a case-by-case basis depending on the size of the operation, access to resources such as labor and capital, and the value placed upon convenience. Overall hay quality may also be a consideration. For large cattle operations, the expense can be spread across a greater number of head, providing a greater economy of scale. Backgrounding operations have the ability to use a bale processor more often throughout the year. For smaller producers, convenience may be an important consideration. 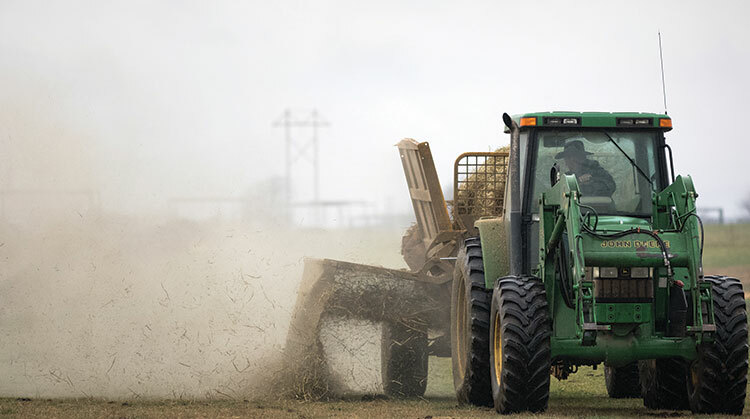 With good equipment care, a bale processor should last for many years. Processing of feedstuffs isn’t a new idea. Using a bale processor is just a new way of accomplishing the task. This article appeared in the April/May 2018 issue of Hay & Forage Grower on page 8.